Water-resource managers use daily mean streamflows to generate streamflow statistics and analyze streamflow conditions. An in-depth evaluation of flow regimes to promote instream ecological health often requires streamflow information obtainable only from a time series hydrograph. Historically, it has been difficult to estimate daily mean streamflow for an ungaged location. The U.S. Geological Survey (USGS), in cooperation with the Pennsylvania Department of Environmental Protection, Susquehanna River Basin Commission, and The Nature Conservancy, has developed the Baseline Streamflow Estimator (BaSE) to estimate baseline streamflow at a daily time scale for ungaged streams in Pennsylvania using data collected during water years 1960–2008. Baseline streamflow is minimally altered by regulation, diversion, or mining, and other anthropogenic activities. Daily mean streamflow is estimated in BaSE using a methodology that equates streamflow as a percentile from a flow duration curve for a particular day at an ungaged location with streamflow as a percentile from the flow duration curve for the same day at a reference streamgage that is considered to be hydrologically similar to the ungaged location. An appropriate reference streamgage is selected using map correlation, in which variogram models are developed that correlate streamflow at one streamgage with streamflows at all other streamgages. The percentiles from a flow duration curve for the ungaged location are converted to streamflow through the use of regression equations. Regression equations used to predict 17 flow-duration exceedance probabilities were developed for Pennsylvania using geographic information system-derived basin characteristics. The standard error of prediction for the regression equations ranged from 11 percent to 92 percent with the mean of 31 percent. The map correlation method for estimating streamflow was tested at locations within two pilot basins, the Upper Delaware River Basin and the Lower Susquehanna River Basin, before being applied statewide. Reference streamgages within the pilot basins were used as ungaged locations for analyzing the map correlation method. Correlation using Spearman’s rho and centroid distance performed as well as, or better than, the method using the closest streamgage as a reference streamgage. Map correlation using the correlation metrics identified in the pilot basins was applied to 156 streamgages in and near Pennsylvania. BaSE uses the map correlation method and flow-duration exceedance probability regression equations to estimate baseline daily mean streamflow for an ungaged location. The output from BaSE is a Microsoft Excel® report file that summarizes the reference streamgage and ungaged location information, including basin characteristics, percent difference in basin characteristics between the two locations, any warning associated with the basin characteristics, mean and median streamflow for the ungaged location, and a daily hydrograph of streamflow for water years 1960–2008 for the ungaged location. The daily mean streamflow for the ungaged location can be exported as a text file to be used as input into other statistical software packages. BaSE estimates daily mean streamflow for baseline conditions only, and any alterations to streamflow from regulation, large water use, or substantial mining are not reflected in the estimated streamflow. 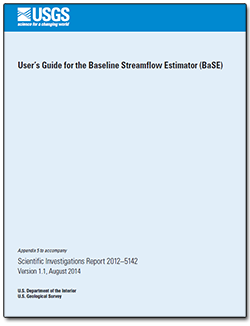 Installer and support files for the Baseline Streamflow Estimator application. Refer to the Readme PDF for more information. 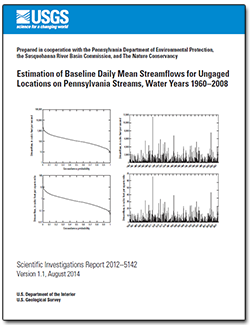 Stuckey, M.H., Koerkle, E.H., and Ulrich, J.E., 2014, Estimation of baseline daily mean streamflows for ungaged locations on Pennsylvania streams, water years 1960–2008 (ver 1.1, August 2014): U.S. Geological Survey Scientific Investigations Report 2012–5142, 61 p., http://pubs.usgs.gov/sir/2012/5142.